Dundee’s Fiveways Centre received an early Christmas present today with the presentation of a £500 Scotmid Community Grant. Cathy Kelly, Manager at Scotmid’s Clepington Road branch, joined in the festive fun at the centre’s Christmas lunch and made the presentation to board members, volunteers and clients. 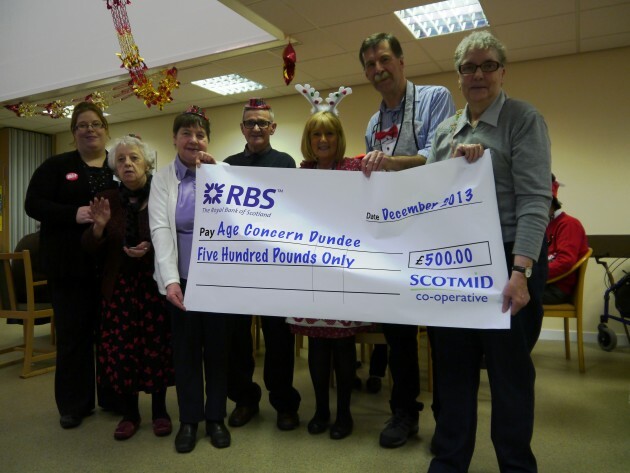 The grant, awarded by Scotmid’s North Regional Committee, is to support the Fiveways Centre in purchasing a new cooker so that clients can continue to enjoy lunches and treats cooked on site. Scotmid’s North Regional Committee is made up of eight, elected Scotmid members. The committee meets regularly to consider grant applications from community groups, charities and non-profit organisations from Perth to the Northern Isles.